In our modern world where transport accident risks remain high, the rescue of the distressed at sea or ocean, in air or on land has become an international and intergovernmental task. This explains why International Satellite System for Search and Rescue COSPAS-SARSAT has become so valuable for the Search and Rescue agencies as well as for the rescue of distressed. COSPAS-SARSAT is a satellite system designed to provide distress alert and location data to assist search and rescue (SAR) operations, using spacecraft and ground facilities to detect and locate the signals of distress beacons operating on 406 MHz with accuracy of less than 100 m for the radio beacons with internal GPS and less than 5 km for the radio beacons without GPS. Type approval of 406 MHz beacons is a national responsibility. However, to assist administrations and manufacturers, COSPAS-SARSAT has developed a type approval procedure. - beacons, when activated, will not degrade nominal system performance. - PLBs - Personal Locator Beacon for land applications. This type of beacons does not belong to EPIRB or ELT type. Our accreditation enables us to perform type approval work on a wide range of equipment operating at 406 MHz, 243 MHz and 121.5 MHz. COSPAS-SARSAT radio beacon Type Approval is a part of national or regional type approval. National and regional standards take into account general requirements to design and installation and may contain specifications not listed in the COSPAS-SARSAT standards, for instance, operational environment, utilization of frequency spectrum, etc. 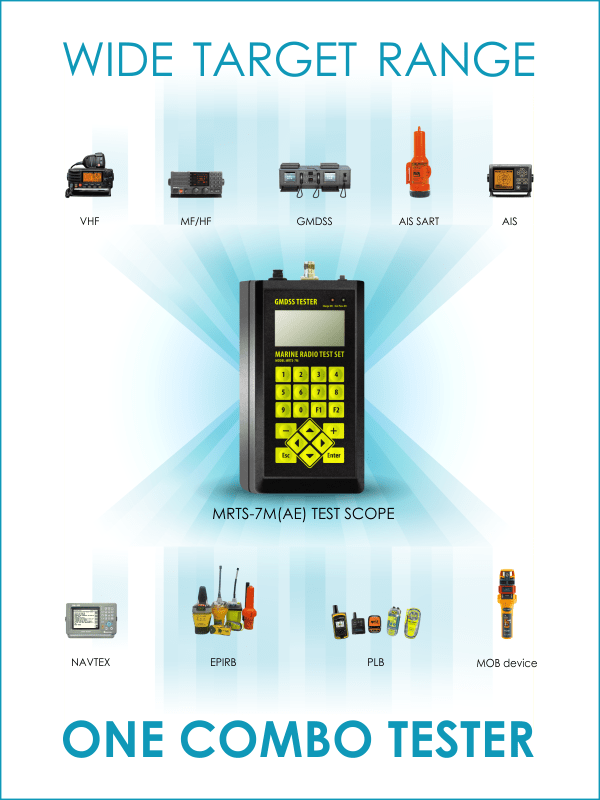 Consequently, each country has its own applicable general and additional specifications for radio beacon testing. - Australia and New Zealand (standards AS/NZS 4280.1:2003 and AS/NZS 4280.2:2003). We also undertake many other regulatory tests, addressing the various EU Directives (MED, R&TTE) and requirements of international bodies, such as Industry Canada, RTCM and FCC. According to the established procedure a COSPAS-SARSAT Type Approval Certificate is delivered by the COSPAS-SARSAT Secretariat to the manufacturers whose beacons have been successfully tested, according to the COSPAS-SARSAT procedure, at COSPAS-SARSAT accepted laboratories. National Type Approval Certificates are delivered by national authorized bodies to the manufacturers whose beacons have been successfully tested, according to requirements of National and regional standards. Our company can provide type testing on behalf of AIS equipment manufacturers worldwide to ensure that the products are able to communicate with any other AIS equipment in use and that the system integrates with marine products such as the communications and navigation systems. Required by IEC61993-2 (Class A), IEC62287-1 (Class B), IEC62320-2 (A to N) etc, which includes EMC, Environmental, Safety, RF and Protocol testing. WE can carry out the product conformity assessment in accordance with the requirements of Technical Regulations including "Technical Regulation for Radio and Telecommunication Terminal Equipment". We have got all the facilities to perform tests for the radio and telecommunications equipment according to the requirements of the R&TTE harmonized standards for European market. We accredited to perform environmental tests in accordance with the following Standards: GOST 28***-89, КТ160-D, EUROCAE ED-62, EUROCAE ED-14 F, MilitaryStandart-810D, MilitaryStandart-461F, IEC60068 Series etc. Environmental tests includes cold, dry warmth, termoshock, temperature gradient, humidity change gradient, icing-up, salt fog, shock tests, vibration, sand and dust, pressure, waterproof etc. We perform electromagnetic compatibility (EMC) testing according to EU and US normative document requirements. We have accreditation with ISO 17025. We provide tests on Electromagnetic Compatibility, principal EMC requirements, EMC testing for various markets, EMC testing for military equipment. We performs tests in accordance with the requirements of the modern international standards, such as EN, IEC, CISPR, ANSI, RTCM, ED, etc. GALILEO REFERENCE BEACON GENERATOR BG-105/102 is high-precision simulator of Cospas-Sarsat emergency beacon messages. It allows to simulate up to five simultaneously operating beacons with messages overlay in time. It gives the capability to run tests on the Galileo and C/S system.